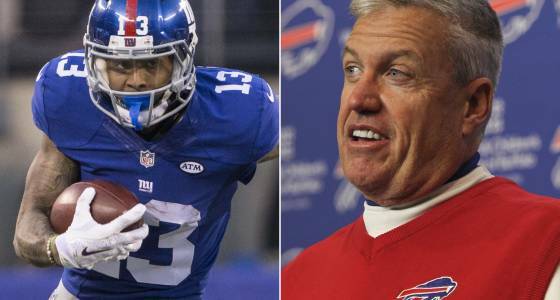 Former NY Jets coach Rex Ryan told ESPN’s Rich Cimini this Super Bowl weekend that the he tried to trade up in the 2014 draft to get star receiver Odell Beckham Jr.
Ryan, who was hanging with Beckham this weekend, claims the GM John Idzik is the one who changed route and stopped the trade. Ryan tried again in preseason when he heard he was out with a hamstring injury. Jets ended up picking defensive back Calvin Pryor at number 18 and their record after the draft was 4 – 12. That year is when Ryan was fired, signing with the Buffalo Bills. ← Even If You Don’t Like Him, Tom Brady Is The Greatest!